Carrot cake cheesecake from Host the Toast is a must-make Easter dessert. There are few moments in life when two things come together and fuse beautifully and that is how I feel about this dynamite dessert. Every Easter, I am confronted with a dilemma: carrot cake or cheesecake for dessert. Both sweet, both delicious but drastically different. This crazy good concoction has eternally solved this problem for me. Carrot cake batter and cheesecake batter alternate until a spring form pan is filled to the brim with buttery goodness. 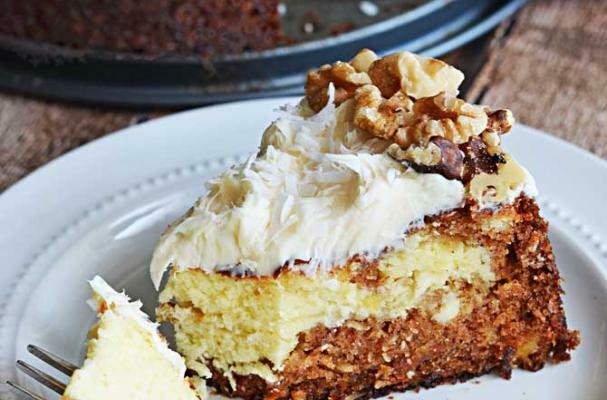 If that's not enough to have your mouth watering, after the cheesecake has been baked, it is topped with cream cheese frosting, shredded coconut and walnuts. Honestly, I can't recommend this dessert enough - it is that awesome.